I made the plunge this week and ventured into the world of cloth diapers. I've been putting this off for quite some time mainly because I was overwhelmed at the many selections and the various methods. Cloth diapers are a big investment (and well worth it) so I wanted to be certain I was choosing the right ones. I found the most helpful information HERE in this article at Passionate Homemaking. If you aren't a reader of this blog, you should be! Its one of the best and most practical blogs with tips on living naturally and frugally- definitely one of my favorites. I went with one size pocket diapers. 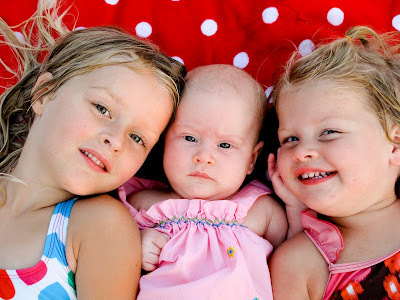 Pocket Diapers are a cloth diaper of convenience and are extremely low maintenance. They are super easy to change and put on. "One size" means that they will last from infant to potty training which was another added bonus for me. "Pocket Diaper" basically means that there is a pocket in the diaper in which you insert a liner to absorb the tee tee and poo. I chose to try two different types of one size pocket diapers. Most women I've talked to who use cloth diapers have an assortment of them and tend to favor one. So based on my many conversations and research, I went with these two. I purchased the ones with snaps because I've heard from various mamas that they wear better and the majority of the diaper companies have a lifetime warranty on the snaps. So far, its going great! I'm so happy that I made the switch! The laundry has been manageable and I don't seem to even feel the slightest burden of them being time consuming. Ruthie has only leaked a few times mainly because I'm a newbie at positioning the liners. I double up on the liners for bedtime now and once I did that, she hasn't leaked once. This was shocking to me because even with a regular diaper she usually leaked overnight. I bought 8 of each kind and had 6 given to me (of the exact same brand I purchased:) to I have a total of 22 to circulate. That is a lot actually and should give me a few days in between washing. Of the two I purchased, I have to say I favor the Fuzzi Buns over the Happy Heinys thus far. The Happy Heinys has LOTS of snaps- almost too many. As Ruthie gets older, I can see where I would really love the Happy Heinys. Since it does have lots of snaps, I can adjust it to fit perfectly. I love the Fuzzi Buns because they have adjustable bands all over (like the jeans for toddlers) that you can make them fit exactly right too. They have bands in the waist and also both legs. The snaps are just right and not too bulky. Our next step is putting up a clothes line so the sun can do its thing by helping with drying and also disinfecting. But its been raining....which we are thankful for! 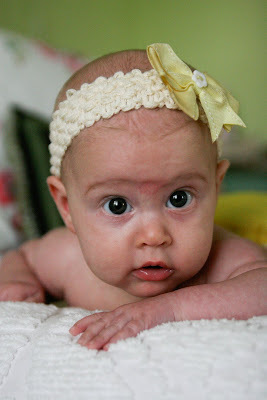 Another thing I plan on purchasing are disposable diaper liners once Ruthie begins solids. These are biodegradable liners that resemble a "dryer sheet". You basically put that in their diaper to catch the poo so that the poo comes off easily. Some of these liners you can even flush and they dissolve over time in the near future. That is my .02 so far in cloth diaper world. I'm by no means an expert yet. Just a momma venturing into the world. Cloth diapers took up my "weird" factor up a notch. But, I'm now a fan of just embracing the weirdness instead of running from it. I'll post more about cloth diapers. As with anything, it was better for me to just jump in with both feet and figure it out as I go. If you are considering making the switch to cloth diapers don't be afraid to find a momma who is using them and ask lots of questions. I've talked with a few gals and made phone calls right smack dab in the middle of changing Ruthie with probably the most obvious questions. My cloth diapering peeps have been more than helpful. There is also a wealth of information online. Don't be overwhelmed. Just pick a few sites and jump in reading. Every mama has their own opinions and techniques. That is the beauty of gathering information from various sources. You can pick what will work for your family and discard methods that may not work so well for your lifestyle. Since I'm a newbie, if you gals out there have any tips, I'm all ears! Throw them out there. We can all benefit from learning from each other. What is your method of washing? 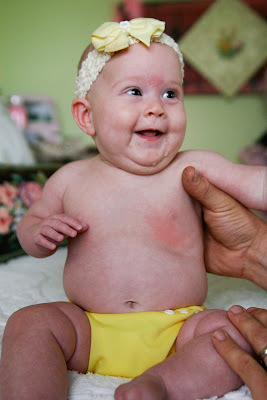 Oh, and we can't forget pics of little Miss Ruthie sporting her new diapers. She is smiling and laughing a lot now! I love this age. Ruthie is still extremely content and laid back. She is so sweet! She is teething right now (yes that's right) at 4 months. 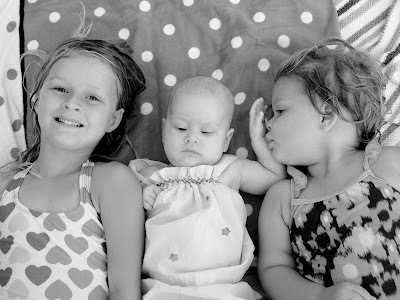 All of my girls have had their first tooth by 4 months. I've heard teething is hereditary so we seem to be keeping with the same pattern. 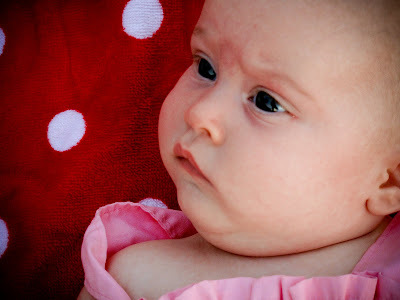 I had no clue she was even teething until I stuck my hand in her mouth and felt the tiniest tooth about to poke through her bottom gums. 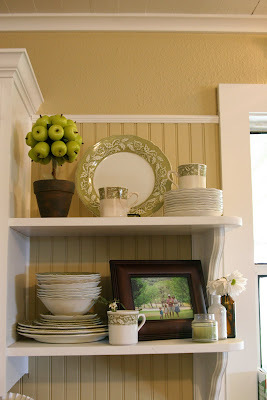 I've been slowly changing out the decor in my kitchen and re-doing the accessories. I'm wanting to go for a more mod country look instead of a retro country look. The color scheme I'm aiming for is green, white, black, and browns- very earthy and clean looking. Since I tend to have this desire to want to re-do things around my home often, I'm all about thrifty finds. MOPS in Brenham had a garage sale last weekend and I hit the jackpot! I even found a few gifts for people. I love a cute gift for $3!!! There was a box full of old kitchen gadgets that were green and metal. In the photo below, the white flower pot is filled with the cute gadgets that I purchased. I also got those biscuit cutters and metal measuring cups. 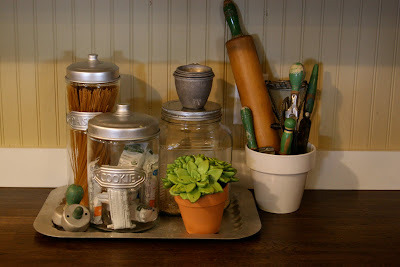 I had the jars and metal tray already so I re-purposed all of this to go with my new look. I also purchased these metal measuring scoops and this white little pot below. Here are the photos of my shelves by my sink that I have redone. 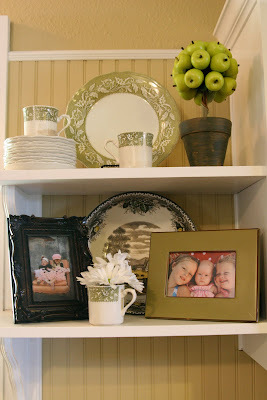 I had all of this around the house except the apple topiaries ($5 at TJ Max) and frames. I still need fabric for valances above the windows so if you have any cute ideas, send them my way! I don't know if I should go with brown, black, white or green. My sister sent a blog my way last week that you should go check out! I love her style over at The Old Painted Cottage. This was my inspiration for my kitchen. A lot of our bones are the same. Her kitchen is beyond beautiful. I have my computer back at my house, so I'm going to be posting regularly again! Kaylyn has fallen in love with sewing. I've started sewing things recently with a newly purchased machine and she has asked questions here and there. 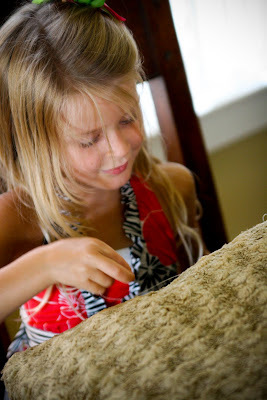 But, after a visit to a sweet friends house and seeing her little girl sew, Kaylyn was inspired. We (Kaylyn and I) often leave these friend's house inspired in some way. Always. We came home that day and she HAD to sew something or she was going to bust. So, we first decided what her very first project would be. Kaylyn dreams big and jumps in with both feet so she went straight to sewing a skirt for her very first project. Kaylyn also happens to be very good at figuring stuff out and trouble shooting so she went and got a skirt that she liked and traced it onto fabric twice- because you would need two pieces to sew them together to make a skirt. She totally figured that part out on her own. I sort of sat back and let her do her thing until she needed my help or needed to ask a question. 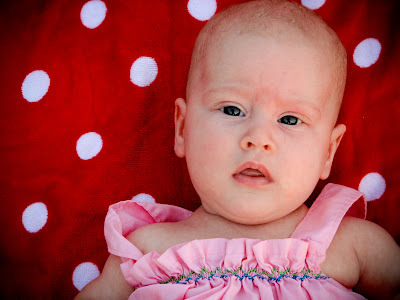 When we got to the sewing part, I was a little worried about how I was going to teach this precious girl how to sew. She didn't know her mama was NOT an expert seamstress and had practically sewn two things by hand and about a dozen on a machine. I decided to learn with Kaylyn and will continue to learn with her as we both can learn and grow in the area of sewing for sure. 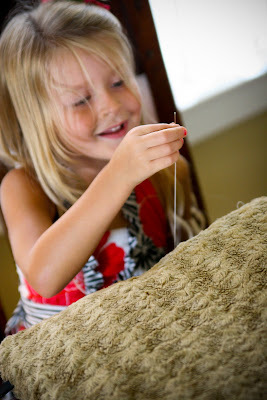 We worked on the "whipstitch" technique and she picked it right up. She whipstitched the mess out of that skirt and had a beautiful creation when she was all done. I don't have a picture of her skirt because she gave it away as a gift to a friend. But, she did notice a hole in our pillow a few days ago. 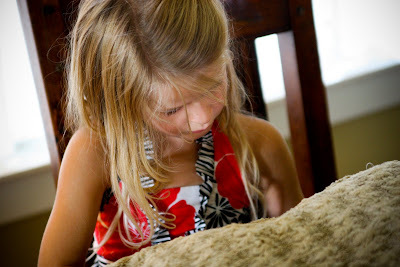 She brought the pillow to me and said,"Mama, would you like for me to sew this hole up for you??" How sweet! She went and got out her sewing stuff and did an excellent job. The pillow has its guts all sewn up. That's what we do most days around here. And most days its twice a day. 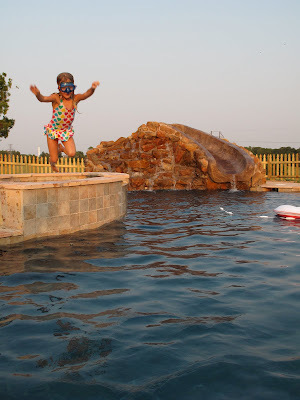 Yonder Way Farm has a saltwater pool and man is it great! There is nothing like a dip in the pool after a hard days work in the Texas heat! Just this summer, Kaylyn has practically turned into a fish. 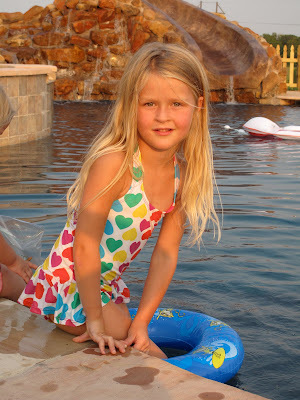 Before the summer began (and the pool was here) she was afraid to go under the water. 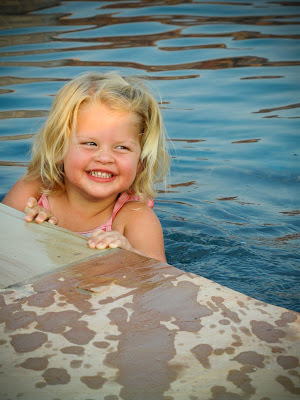 By the end of summer, Kaylyn is swimming completely across the pool unassisted. I beat myself up because I was a loser mom this summer and didn't sign her up for swim lessons. I thought she might be ready for them. 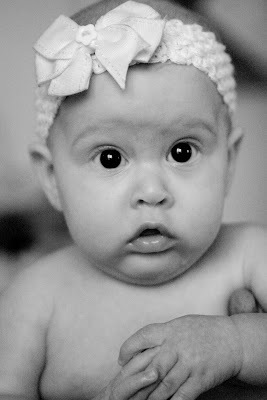 But, then I instantly cut myself some slack when I realized I had a baby on May 22nd- the first day of summer! And she was indeed ready to branch out into the world of swimming this summer. I'm so proud of her! 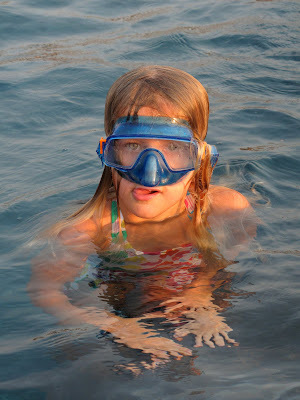 Speaking of Kaylyn....we've had a good bit of laughs over her obsession with goggles this summer. She will not swim without them. We've went through a few pair this summer because she has worn the straps out. We decided early on this summer that Kaylyn looked like the old man in the Six Flags commercial that dances like a crazy loon. I happen to love that old man....who I've been told is in fact either a famous celebrity man or a regular young woman who happens to have mad dancing skills. Before you think I'm scarring her for life, we've discussed this with her and she actually laughs with us about it. Especially after I showed her who this character was. Kaylyn has a brilliant sense of humor. I love that about her:). Laney Rae is just as fun in the pool as she is out of it! 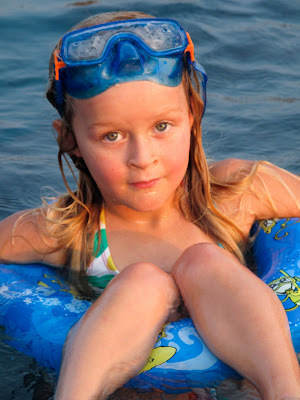 We pretty much duck tape a life jacket or arm floaties on her and let her go at it. Do legs get any cuter than this???? Ruthie isn't much into swimming yet. 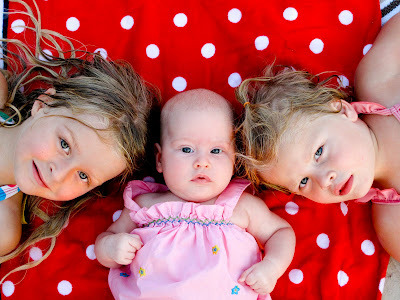 She loves laying outside by the pool on a towel and listen to her sisters play and splash in the water. 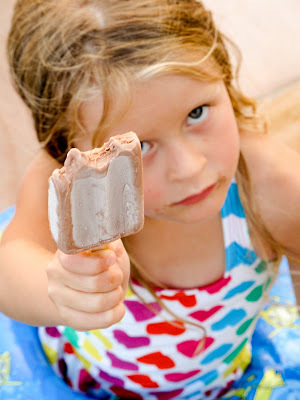 Oh, and we love us some Blue Bell by the pool. Hey, it's LOCAL right????? Here are some more pics of my girls swimming. 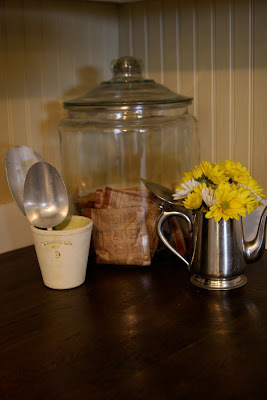 I LOVE LOVE LOVE this blog- Simple, Green, Frugal Co-Op. Its a collection of ladies who desire to live a simple, green, and frugal life. I can't tell you how many things I've learned from these ladies. They are the real deal. I walk away inspired all of the time. I've emailed a few of them personally with questions and they've always taken the time to respond and encourage. There was a new post on this blog that totally struck a chord with me. For the sake of some of you not clicking on the link and going over to read it, I'm going to post it here because I think its definitely worth reading for those of us desiring to return to a more simpler life. "But the real skill, the one that made all these things come together for me was to use them daily, consistently, to patchwork a life worth living. Until you can do that – see and understand the relationship between the elements of your simple life - your garden, kitchen, chickens, sewing, no debt living, or whatever they are, and the joy to be found in those simple things, all you’ll be doing is carrying out a series of simple tasks. Anyone can learn how to mend a sock or bake bread, you need to develop the mindset of someone who strives everyday to live simply for it to have meaning." Hello, my name is Rhonda. Some of you won’t know me because I rarely write here now but I started this co-operative and invited these talented and thoughtful writers to share their experiences here for the world to read. I do my writing in other places now but it is a real pleasure to come back and write rather than just read here, which is what I usually do. I’ve been thinking a lot lately about all the skills I lost and regained when I started living a more simple life. Over the years, like many others, I was encouraged to become dependent on cheap Chinese imports and the convenience they provided. I bought fast food and forgot about cooking true to my heritage. I was proud to have enough money to be able to throw away clothes that needed a button sewn on or a seam mended. Looking back on it now I see that lifestyle as a waste of money, time and effort. I wasted money buying more than I needed, I wasted time and effort working more to pay for my stupid excesses. I live life now without wasting money, time nor effort. My days are full of the kind of gentle slow routine that makes each day flow. I grow vegetables, collect eggs, pick fruit, tend my million worker worm farm, I mend, create, knit, I make soap and cleaners for my home, I cook from scratch every day, I bake bread and cakes, I volunteer and I teach what I know in my community and try to show others , by example, that this kind of living holds a richness that credit card funded shopping sprees never come close to. I am in my 60s so I’m lucky that I’ve seen firsthand many of the things I do in the course of a common day, done expertly, many years ago, by my grandmother and sometimes by my mother. The skills they didn’t show me, I have taught myself. They make bread and brawn, but never cheese. They made ginger beer but not vinegar. They would have been interested in how I make sauerkraut but I learnt how to pickle beetroot and cucumbers watching them. I never thought when I first decided to turn my back on my old life that the way to live a more enriched life was to regain the skills taught to me by my granny and mother. But the real skill, the one that made all these things come together for me was to use them daily, consistently, to patchwork a life worth living. Until you can do that – see and understand the relationship between the elements of your simple life - your garden, kitchen, chickens, sewing, no debt living, or whatever they are, and the joy to be found in those simple things, all you’ll be doing is carrying out a series of simple tasks. Anyone can learn how to mend a sock or bake bread, you need to develop the mindset of someone who strives everyday to live simply for it to have meaning. When you develop a simple, green and frugal mindset, it all falls into place. You start with one step, which leads you to the next and the next. Following your path this way will lead you gently to each stage and when you look back you’ll realise how far you’ve come. It’s an interesting journey we are all on. Don’t ever expect to get much feedback or encouragement along the way because we aren’t living the life most choose to live. But choosing this life deliberately and rejecting the excesses we are encouraged towards will make you stronger and more self reliant. Not everyone is cut out for this, at times it’s difficult and you work hard but it will also bring you the rewards of independence, freedom and choice, and they are fine prizes.